For a City with Space for Cycling. We lobby. We campaign. We publish. We inform. 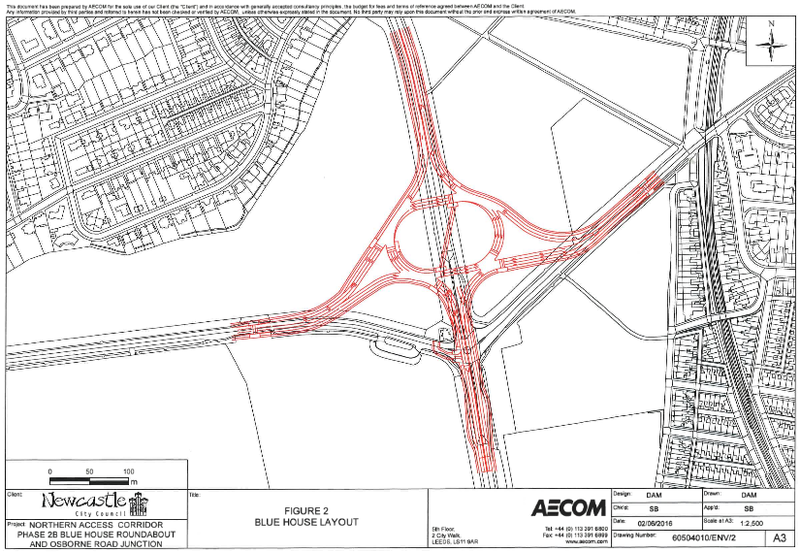 This is a swift response to the Blue House roundabout plans, which we deem unacceptable. A longer, technical, response will follow. UPDATE 3 August 2016 detailed response published here. The plans for this junction are fundamentally wrong. Only with real transport planning, tackling the real problems, can we see Newcastle’s policies of mode shift and transport transition realised. Only then, can council spatially prioritise walking and cycling and create the ground conditions for mass cycling. Newcastle has a primary ring road system A1/A19, and first of all its local road network must be assessed for its space, whilst keeping one eye on community wellbeing strategies, mode shift and transport transition away from the car. If Newcastle do decide to increase motor traffic (we do not think it is a good idea at all) the current junction layout would need a rather different design solution. The plan focusses on motor traffic and simply attempts to shoehorns in some provision for walking and cycling. To see walking and cycling designed into the network with the planned volume and speed of traffic along this corridor, grade separated crossing solutions would be necessary. This way, cycling in particular would become a viable transport alternative. These are local roads that converge at Blue House roundabout, and these roads should serve Newcastle. The entire design philosophy is wrong. The council need to go back and do some basic transport planning for the so-called “Northern Access Corridor” to create a design that serves Newcastle communities. Only then would council have succeeded in creating a platform to discuss cycling and walking infrastructure. The opportunities for through motor traffic need to be minimised, to ensure that the liveability of Jesmond and Gosforth, and indeed all areas along the “Northern Access Corridor”, are not further degraded by increasing motor traffic through the heart of Newcastle’s neighbourhoods. “The recent plan of the Northern Access Corridor, a motorway running through Blue House and Haddricks Mill, sadly shows very clearly that we are currently running on twin tracks. Council’s transport thinking is still dominated by road-building highway engineering, wrecking communities and citizens health and wellbeing in its wake. “The announcement of the Northern Access Corridor in the Local Plan was highly schizophrenic for a city that wants to clean up its act and become a city for people. We were very skeptical then about the nature of this scheme. A couple of years on, and we can now see its destructive plans unfold in detail. But council can only choose one way forward from here. “A liveable city exists only when a healthy variety of transport options is put on offer. Cycleways are an intimate key component of a liveable and thriving city. And Newcastle needs a budget to work on its liveability and competitiveness. More roads, always means more cars – and less space for anything else. This is not how to get people to leave their cars at home, clean up the city’s dirty air, reduce noise pollution, community severance or tackle the obesity crisis.